Pro-Ject Primary E budget turntable review | What Hi-Fi? You don’t need to set eyes on Pro-Ject’s Primary E turntable to know it has a lot going for it. It’s the most affordable traditionally designed Pro-Ject turntable – the brand’s Elemental deck, also priced £150, has a platter that sits over a long and thin, plank-like chassis (imagine a pizza draped over a wooden serving board). 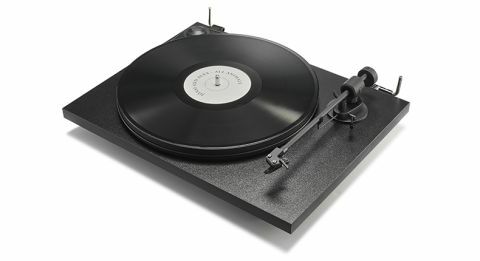 And the E is also more or less a twin of the Pro-Ject Primary deck that we handed five stars early last year. Like most twins, there are a few key differences that set the two apart. The Primary E’s power supply is built into the deck rather than the plug; it is only available in black rather than the Primary’s red or white options; and it costs £20 less than the original model. So with the Primary due to continue for only a short period longer, how does its successor measure up? The Primary E has a familiar look, from the 22cm tonearm and Ortofon MM cartridge to the effortless set-up of the near-plug-and-play design. As you might expect from a similarly specified machine, the Primary E has an entertainingly musical performance akin to the Primary’s, too. While our sonic expectations are rightfully tempered for a £150 turntable, the Primary E’s priority seems to be entertainment. Sure, there are glimpses of dynamic insight and subtlety to its presentation, but it doesn’t try to walk before it can run. The Primary E confidently nails the basics, from an even tonal balance to a delivery that’s clear and clean and spacious enough to keep things coherent. Decent body and substance cling reliably to every frequency, and that’s made all the more enjoyable by a spirited sense of drive and momentum. We lay down The National’s Trouble Will Find Me, and the Pro-Ject wilfully promotes the LP’s warmth and sweetness, communicating Berninger’s vocals as well as the contrasting sense of effort behind the track’s drum beats. It is sensitive to the sullenness of the band’s instrumentals, demonstrating levels of detail and precision that are more than passable in the company of budget amplification and speakers. And though it’s not capable of huge scale or reach, it sounds far away from being small or confined, too. By the time we reach the final track, Hard To Find, we’re asking ourselves what more we could want from a £150 deck. Realistically, very little. You don’t have to set aside an hour of your time, nor dust off the toolbox before you can benefit from the Primary E’s performance. With the anti-skate weight and the 1.7g tracking force pre-set (there’s a stylus pressure gauge in the box for checking the latter), all you’re required to do is attach the belt to one of the two motor pulleys, depending on whether you’re playing a 33.3rpm or 45rpm record. Turn on the power switch underneath the chassis; and connect the attached RCA cable to either an external phono stage, or the phono input of an amplifier with one built in. A standard cover is supplied for keeping the Primary E’s chassis dust-free when not in use, but as you’d expect at this price, there’s no lavish aesthetic or hipster chic here. The all-black design is fairly plain – this is no turntable-in-a-suitcase Crosley or bright-coloured Lenco. We find the chassis’s edges and corners a little on the sharp side when we run our fingers along them, but, given that’s our only grumble, it speaks volumes of Pro-Ject’s latest budget offering. With the likes of £100-odd Lenco, Audio Technica and Crosley turntables knocking about, you can spend a bit less to get your first turntable. But sometimes it’s worth remembering what Victorian art critic John Ruskin once said: “it's unwise to pay too much, but it's worse to pay too little”. For purists at the head of the beginner’s vinyl revival path who have a £150 budget and aren’t fussed about features such as record ripping and automatic operation, the Pro-Ject Primary E could be just the ticket.